This full-featured unit has onboard system monitoring that adjusts motor performance to handle liquid and run twice as fast on vapour. The MR45 can also step up low voltage at the supply input to deliver full power to the motor where high voltage drop is a problem. This protects your recovery unit and allows you to get on with the job regardless of power issues. The Fieldpiece MR45INT is equipped with a powerful 1HP motor and over-sized condenser, this recovery unit performs flawlessly on those longer and hotter jobs in the peak of the busy Summer season. 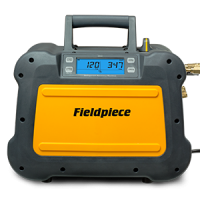 This Fieldpiece Recovery Unit has an easy-to-read display, is lightweight (10Kgs), comes with straight hose connection ports, and a single dial makes this machine user-friendly while being tough enough for everyday use. Its small footprint means it takes up less valuable room in your service vehicle as well.